These beautiful blue flowers will brighten your loved one's winter day and fill their heart with warmth for many months following. Call, stop in to A NEW LEAF FLOWERS & GIFTS, or order yours online today! A perfect example of just one of many very special holiday arrangements to be offered by A New Leaf Floral. This magnificent blue and white arrangement truly says: "Happy Holidays!" or, "Happy Hannukah." 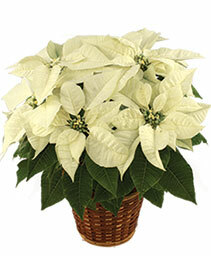 Deliver the Christmas spirit to family and friends with this Elegant White centerpiece. A New Leaf Flowers and Gifts can deliver fresh flowers for you today. Start the New Year fresh and beautiful with a showy bouquet of winter- white flowers from A NEW LEAF FLOWERS & GIFTS. We can surprise someone special for you! Feel free to call us or order flowers online 24/7. Celebrate beautifully with a special occasion arrangement from A NEW LEAF FLOWERS AND GIFTS. With accents of silver foliage, this bouquet features the purity of white lilies and star of Bethlehem, and tall, graceful stems of brilliant blue delphinium. Call us or order Madison, WI flowers online now for your special occasion or holiday. Winter bouquet of flowers that sparkles with gold accents. Warm the holidays with flowers delivered from your Madison flower shop A New Leaf Flowers and Gifts.